Additional Information: For the third straight season, the Phillies produced a completely redesigned and updated team set at midseason, rather than just update the set released at the start of the season. As with previous midseason sets, the Phillies updated this one as well. However, the updated second printing of the set was distributed extremely late in the season. Jim over at The Phillies Room has much more information about the update in a mid-October, 2012 post. Because of late season trades and minor league call-ups, a large number of cards were available exclusively either in the first or second version of the set. In the checklist below, each of these cards is marked as an SP and carries a notation stating the printing of the set in which it appeared. Given the timing of the updated set, it is likely that far fewer quantities of those cards exist. 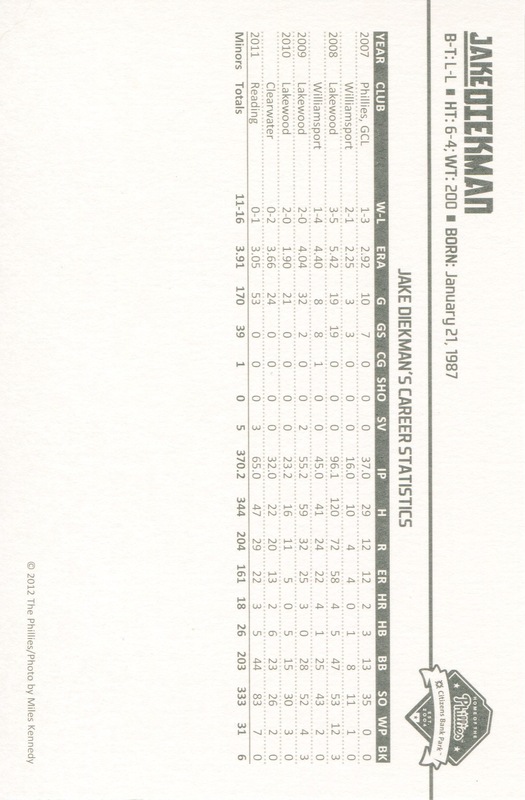 It needs to be noted that this set contains the very first card ever issued for Jake Diekman. 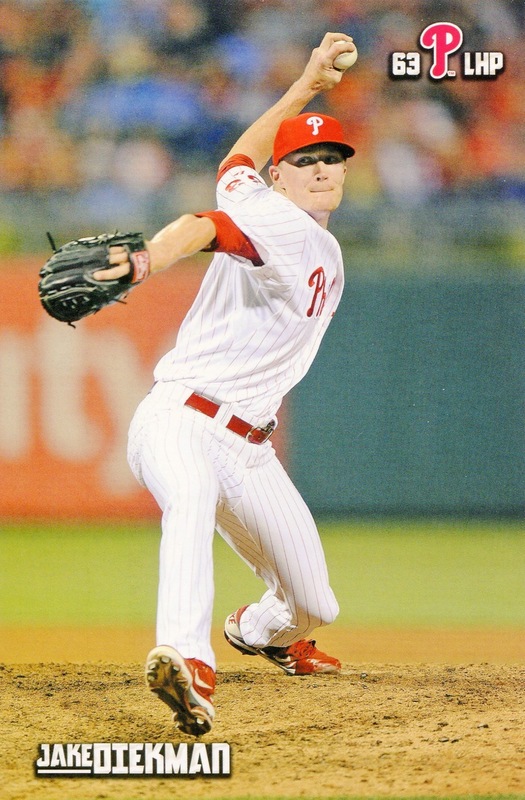 Somehow, Topps managed to overlook him during its many different Bowman Prospect insert sets since he entered the Phillies organization in 2007. As with all other Phillies team-issued sets, the cards are not sequentially numbered, instead bearing the player’s uniform number. In the checklist below, the cards are listed in alphabetical order by last name and assigned numbers accordingly.